Machrihanish Golf Club was established in 1876 with ten holes, then “re established” in 1879 when Old Tom Morris expanded it to eighteen including the famous first where you have to carry a healthy corner of the Atlantic. The course was modified again in 1914 by J.H. Taylor and Sir Guy Campbell made further alterations when several holes around the turn were lost due to development work at the Campbeltown airport site next door. The course is set in wonderful dunes in the small village of Machrihanish, which is situated on the western side of the remote Kintyre Peninsula; this is where the sky is big, the sunsets are dramatic and the air has been warmed by the Gulf Stream and its relative inaccessibility has saved it from becoming more commercialised. Machrihanish has become well known in the last few years mainly because of its exceptional first hole which requires the round’s opening shot to carry the Atlantic. Its 6,462 yard par 70 plays fast and firm through larger than normal Scottish dunes to greens some like punchbowls, some like plateaus. This links must be one of the most natural, romantic and most enjoyable places to play golf in the whole of the British Isles, with an outstanding front nine and a thrilling start. The first, called “Battery”, is one of the best opening holes in golf, a teasing 423-yard par four with an elevated tee on the edge of the shore; it is a tough start, particularly into a breeze. The fairway hugs the beach and we must drive diagonally across it. Machrihanish is not just about one great opening hole, the front nine is exceptional and the entire experience is magical. The greens are firm, fast, true and are positioned in the most varied of locations. Some are sunk in punchbowls whilst others are on a raised plateau or flattened dune tops. 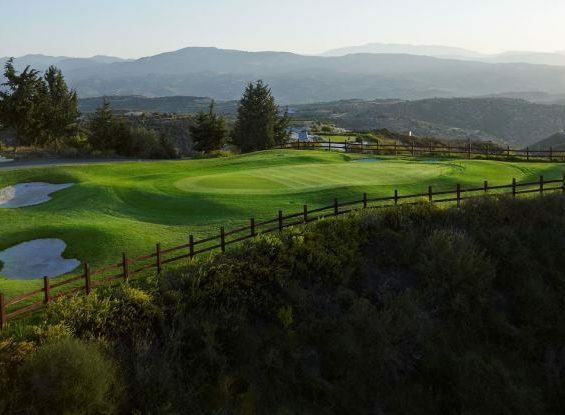 There are blind tee shots, fabulous sea views, undulating rippling fairways and exciting rugged dunes.